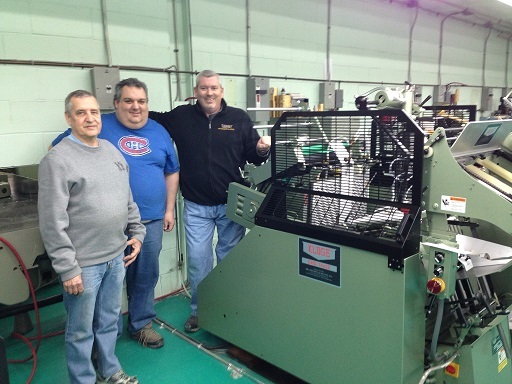 Gravure Choquet, Montreal, QC has recently installed a Kluge 14×22 EHD Foil Stamping, Embossing and Diecutting Press. Of their five Kluge EHDs, this press is configured with an optional pre-load magazine allowing the operator to load sheets without stopping the press, especially useful when feeding thicker stocks and book covers. The Kluge EHD Series has made its mark delivering complete and solid foil stamping coverage; deep, crisp embossing; and clean, accurate die cutting. Founded in 1973, Gravure Choquet is a trade finisher at the forefront of Canada’s specialized printing industry providing service to a diverse clientele of major printing plants, advertising agencies, and all sizes of business. Choquet currently has 24 presses capable of finishing a variety of sheet sizes from large to small. “We keep at least three of our Kluges busy every day, sometimes all five. The 14×22 EHD is ideal for feeding and foil stamping pre-diecut folding cartons. It also allows us to diecut jobs without nicking so nothing has to be sanded, the product goes direct into the box. The ease of feeding and make-ready make it a good choice for our small quantity, short runs that would be too time consuming on a larger press.” -Patrick Choquet, Owner, Gravure Choquet. Choquet was recognized with high honors in May at the 2013 Gold Leaf Awards, receiving the Best of Show Award for a piece entitled “Kurz Christmas Cards”. In total, they received awards for 5 outstanding pieces of high quality work showcasing foil stamping, embossing and specialty effects on a product. Patrick Choquet credits his experienced team of artisans for their success, “It takes skill and care to do this and a very good and talented press operator.” The full list of winners with detailed descriptions of their winning pieces can be found on the FSEA website at www.fsea.com. From the left Douglas Lambert (Master Press Operator), Dominic Gendron (Press Operator), and Andy Dvorsky (Kluge Field Service Technician).